My wild child cousin Tanya married this past weekend with all the spirit and joy of a bustling brouhaha. She drew to her celebration her closest friends, relatives, and neighbors, and screamed wildly as she took another step towards genuine happiness. 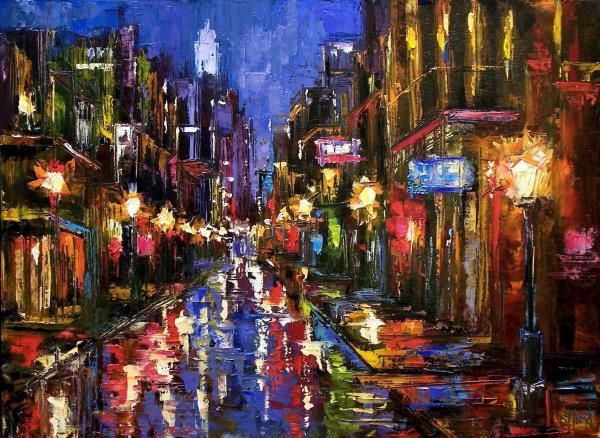 Her bright smile glistened against the dampened streets, brightening our way towards shrimp boil and twilight elixir. I had never been to New Orleans, but had heard so many wonderful stories about the unique borough. Drenched in history, bejeweled with culture, and gifted with panache, this drippy draw of a town had most definitely captured my heart at hello. I was met with some of the most talented musicians playing in the free air that I had ever encountered as I smothered myself with butter-filled morsels of heart-stopping goodness. While NYC jolts the senses, NO seems to entice, soothe, and seduce. I have a feeling this will not be my last visit, as I have yet to try their legendary crawdads, dreamy beignets, hearty po’ boys, and delectable alligator sausage. Yes, the food will lead me, while the charm of the south continues to call my yearning heart back for more. This entry was posted in Beauty, Celebration, Connection, Fun, Love, R&R and tagged beauty, flight, get out, inspiration, love, quality of life, recharge, reconnect, taking time, travel, welcome. Bookmark the permalink.